Dr. David Allen is married to the former Sherri E. Greene. They have 4 children (Jeremy, Jared, Melody, Kali), one daughter-in-law (Joelle) and 3 grandchildren (Judah Allen, Lydia Allen, Hudson Allen). Ministry at Southwestern Baptist theological Seminary. He received his Ph.D. in Humanities, University of Texas at Arlington (1987) (Major: Linguistics; Minor: Philosophy); M.Div., Southwestern Baptist Theological Seminary (1981); B.A., Criswell College, Dallas, TX (1978). 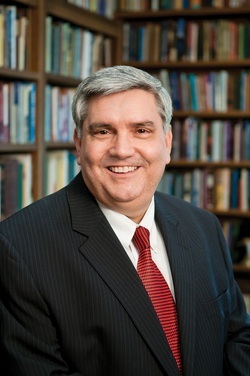 Dr. Allen's research and writing has focused primarily in the area of Biblical Studies and Preaching. In addition to numerous journal articles and essays, he is the author of Hebrews in the New American Commentary series and Lukan Authorship of Hebrews in the NAC Studies in Bible & Theology series. He also co-edited and contributed chapters to Whosoever Will: a Biblical-Theological Critique of Calvinism; Text-Driven Preaching: God's Word at the Heart of Every Sermon; and The Return of Christ: a Premillennial Perspective. He is currently working on 1-3 John in the Preaching the Word series published by Crossway, which will consist of a series of expository sermons on the Johannine letters. Dr. Allen's current research interests revolve around the theological issue of the extent of the atonement and its impact on preaching, evangelism and missions, as exampled in his chapter "Preaching for a Great Commission Resurgence" in Great Commission Resurgence, published by B&H. Dr. Allen has served as a senior pastor of two churches for 21 years, as well as several interim pastorates. He leads Preaching Workshops locally, as well as at the Associational and State Convention level within the SBC, and is a frequent speaker at Church Bible Conferences, and Pastor's Conferences around the country.